My husband works so hard for our family. Recently, we made the decision to ditch our satellite service. It was something he was reluctant to do, but it’s saving us quite a bit of money each month. I really wanted to do something special for him for Valentine’s Day this year. He loves watching movies. We used to watch movies together all the time before we had kids. Now, with several little rugrats running around, we don’t get to sit down and watch a movie together very often. 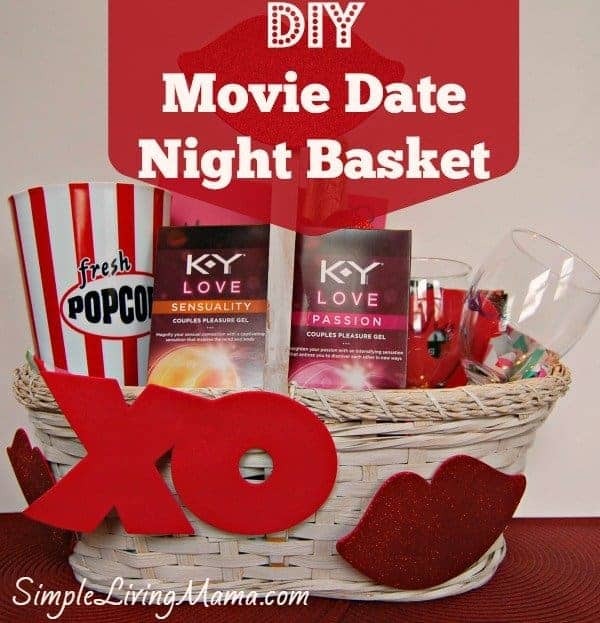 A DIY movie date night basket seems to be the perfect present for my hubby for Valentine’s Day! First, I went to Target to find all of the components for my DIY movie date night basket. The Dollar Spot had a lot of cute Valentine’s Day stuff. 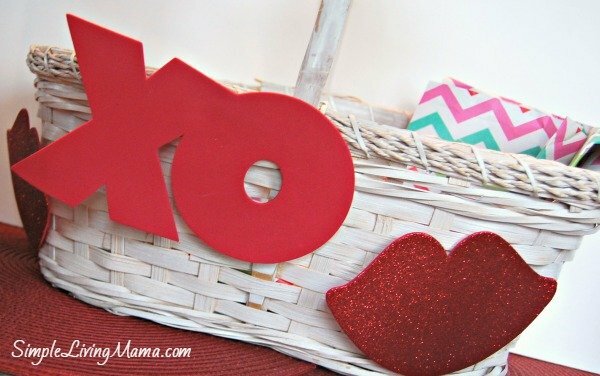 I picked up a pack of foam lips and xo’s to decorate the basket. 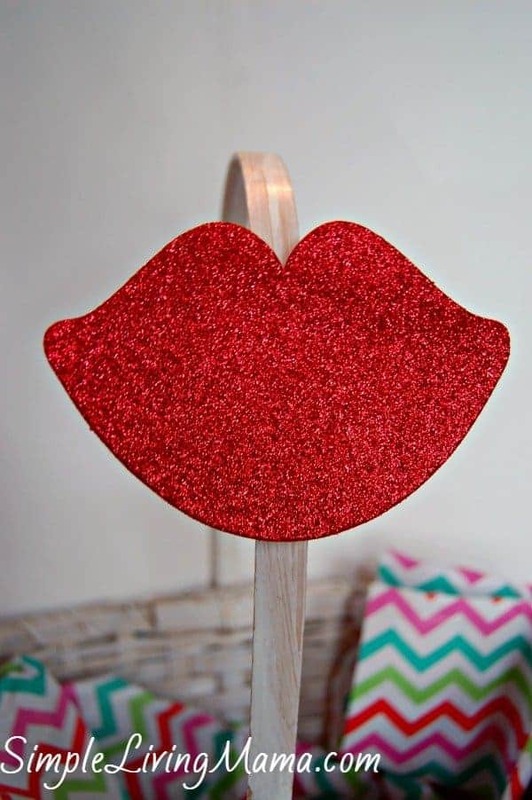 I just used a little hot glue, and stuck the foam pieces on the basket to decorate it for Valentine’s Day! Here’s one on the handle. And a few on the basket. I also found this cute wrapping paper at Target. 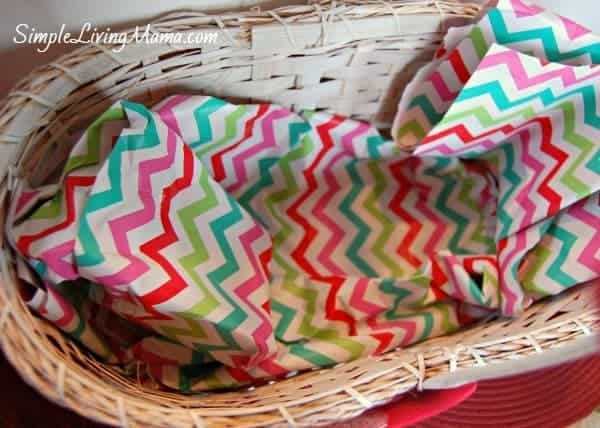 I used it as stuffing for inside the basket. 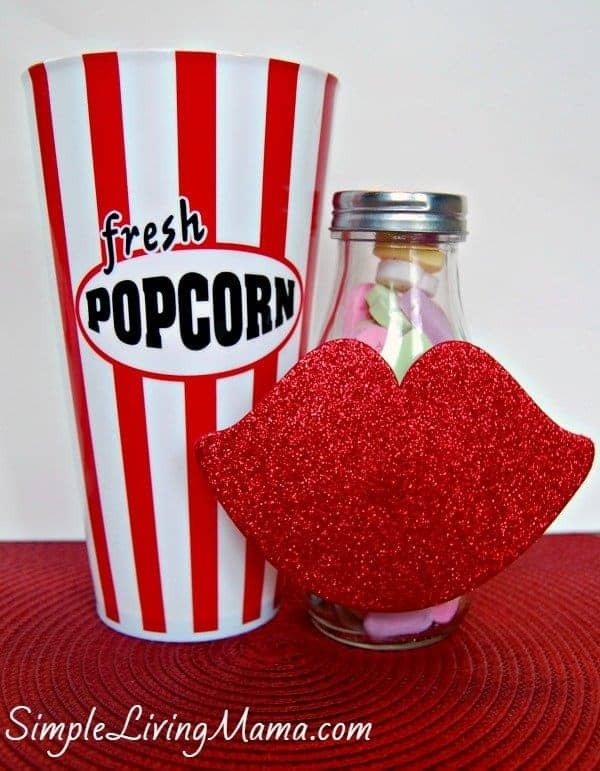 I found this cute popcorn holder, which is perfect for our movie date night basket. I only got one because I figure we would definitely sit closer if we have to share. This cute glass bottle was also in the Dollar Spot. I decided to fill it with candy hearts. I picked up some of my hubby’s favorite chocolates and other treats for the basket. 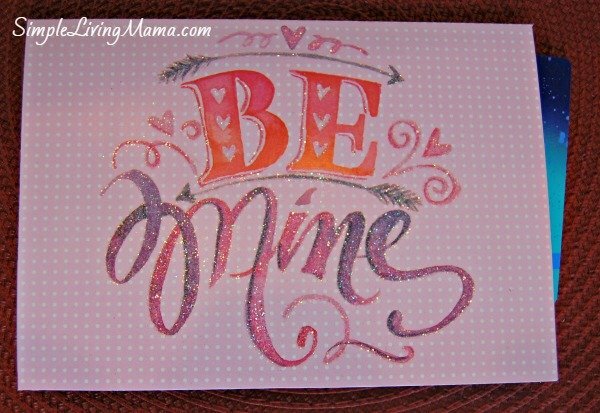 A cute card with a handwritten message just for my hubby holds a gift card that can be used to rent movies. This way, he can pick whatever movie he wants to watch. Of course, a date night isn’t complete without a little intimacy! As an unexpected surprise, I decided to throw in K-Y® LOVE. Hey, intimacy is so important in marriage and it’s so easy to fall into a rut especially when your days are filled with providing for the needs of your children. I thought this would be a great way to show my husband that I still care about that aspect of our relationship! 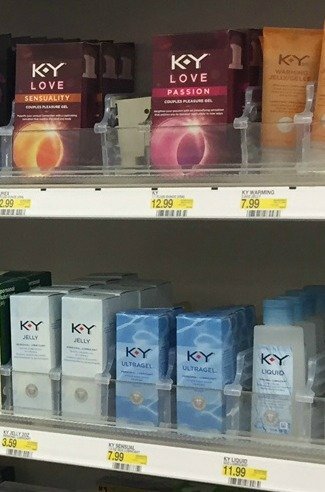 You can find K-Y® LOVE Sensuality and K-Y® Passion at Target in the feminine care section. 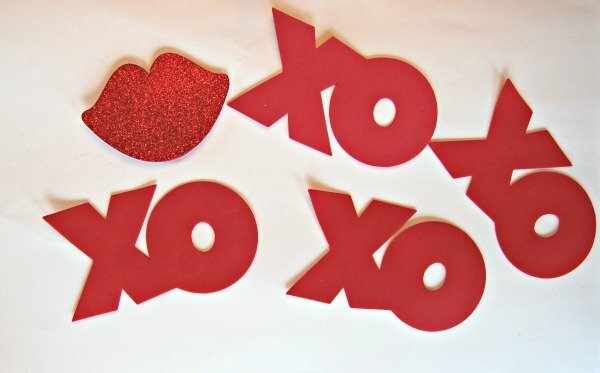 These products are exclusive to Target for Valentine’s Day! As an added bonus, check out the Target Cartwheel offer to save a little on bringing some intimacy into your marriage! The Cartwheel offer is good through 2-14-14. The last thing I added to my gift basket was a little sparkling cider (you could add the real deal) and some wine glasses I found at Target. They only cost $1.00 each! 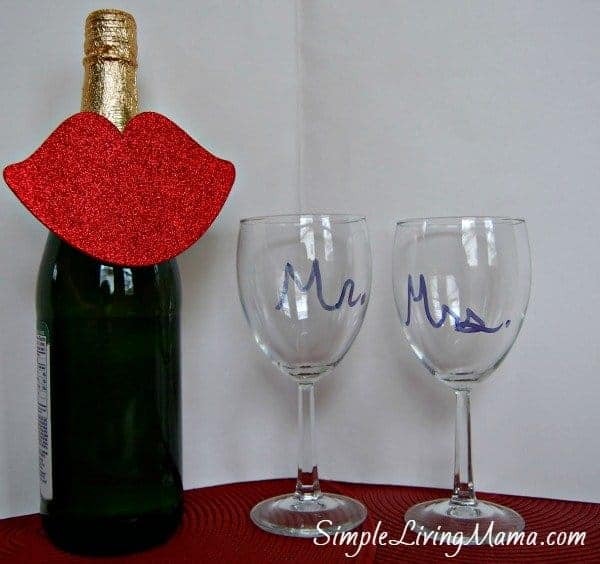 I used a permanent marker to add a special Valentine’s Day design to my wine glasses. 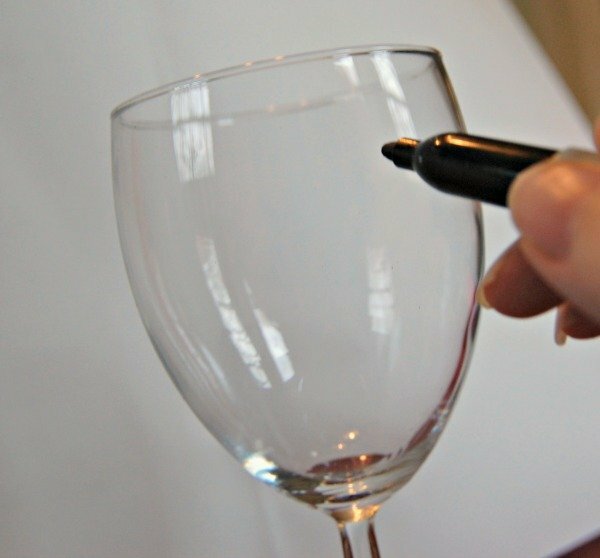 Just make sure your wine glass is clean and leave at least one inch from the rim of your glass to the start of your design. When you’re finished, bake in the oven at 350 degrees for 20 min. I used a cookie sheet to hold my wine glasses. This gives the marker a little more staying power, but remember to only handwash your glasses! 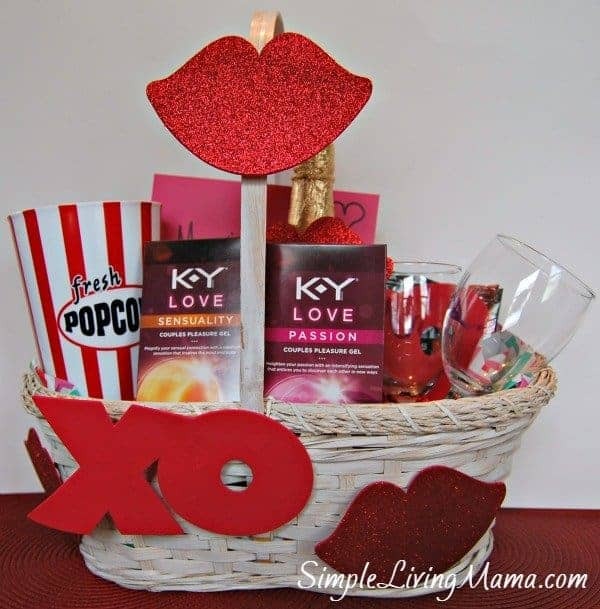 I really hope my husband enjoys his DIY movie date night basket! I just love creating gift baskets because you can really hand pick items you know your special someone will love. What kind of gift basket would you create for your Valentine? It was tough on him! I hope he loves his gift basket!